(NaturalNews) Dating all the way back to the 5th century, with even older roots in a traditional Roman holiday, the day of romance and love we call Valentine's Day has been around for as long as we can remember. Every year, on February 14, more than 141 million Valentine cards are exchanged between lovers and friends throughout the world. Candy, red wine, gifts and flowers abound, as we each try to make our special "Valentine" feel extraordinary. Although not any kind of chocolate candy will make a difference, it turns out Valentine's Day is also our healthiest holiday. In fact, what we tend to eat on this lovely day is very similar to a trending, new eating plan called the "sirtfood" diet. Recent studies have often pointed to the impressive health benefits of chocolate, but it's important to distinguish between chocolate, cacao (the original plant) and cocoa (the powder obtained from roasting cacao seeds). It is only certain kinds of chocolate, especially those rich in cacao and cocoa, that are really healthy for you. Dark chocolate, for instance, ranks among the most powerful superfoods known to mankind. Cocoa powder is rich in antioxidants, and contains a decent amount of fiber as well. When digested, the components in dark chocolate are broken down and transformed into anti-inflammatory compounds that reduce the inflammation of cardio-vascular tissue, and therefore protect you against heart disease. In one study, higher levels of chocolate consumption were associated with a 37 percent lower risk of cardiovascular disease, and a 29 percent lower risk of stroke. What better way to celebrate Valentine's than by literally helping your heart with a box of dark chocolates? And that's not all. Dark chocolate has been associated with no less than 40 health benefits, including neuro-protection, lower Alzheimer's risk, reduced stress hormones, improved liver function and an overall extended lifespan. Some wine to go with that? Of course, no romantic Valentine's dinner is complete without a glass of fragrant red wine. Like chocolate, this Valentine's Day specific beverage has demonstrated numerous health benefits. As soon as it became available in ancient Greece, wine made its way into our arts, literature and lives. Moderate amounts of wine were also used for medicinal purposes. Today, we know that moderate consumption of red wine can help reduce the risk of depression and dementia. It is also associated with anti-aging properties, as well as with a lower risk of developing breast, lung or prostate cancer. 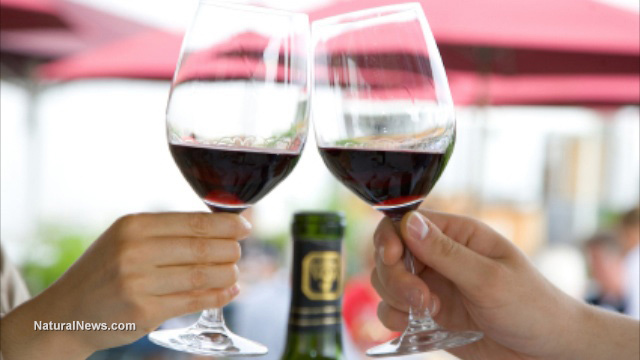 Wine was also shown to protect against type 2 diabetes, stroke damage and even liver disease. The "sirtfood" diet has recently gained in popularity by advertising a way to stay slim while eating chocolate and drinking wine. The eating plan proposes a higher intake of foods that are rich in sirtuin activators. Aside from the two Valentine's Day specials described above, other sirtfoods include apples, citrus fruits, blueberries, green tea, soy, strawberries, olive oil, red onion and kale. The compounds these foods contain are supposed to help protect body cells against inflammation and death, while also increasing your metabolism. While the efficiency of the sirtfood diet in regard to weight loss is debatable due to its severe calorie restriction, its popularity has drawn attention to one notable fact. Indeed, it seems that the resveratrol contained in foods like wine and chocolate can lead to weight loss by turning calorie-storing white fat into calorie-burning brown fat. As a powerful antioxidant, resveratrol is also beneficial for your health. There you have it! Now you know why celebrating Valentine's Day is not only pleasant, but also quite healthy. Could your childhood relationship with your parents be affecting your romance?